Alev Karagulle at Burgess sends me a note to say they’ve taken over the central listing for sale of the 43.6m motor yacht Smile with a €1million price reduction. Built to ABS class in 2006 as the seventh in the highly successful and very popular Benetti Vision series and built for her current owner, Smile has always operated as a private yacht. 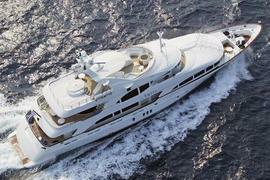 Her François Zuretti designed interior is light and spacious with accommodation for 12 guests spread over three decks. The master suite, situated forward on the main deck, boasts a 360 degree rotating bed and has direct access out onto a private deck. The flexible accommodation layout is completed with a VIP suite on the bridge deck facing aft, two double and two twin cabins on the lower deck (additional single pullman berth in each twin cabin). Of particular note is the guest elevator servicing all decks. The vast sun deck for a yacht of her size offers a great mix of casual seating areas, sunpads, jacuzzi and barbecue, making her perfect for entertaining large numbers of guests or for relaxing in privacy. Smile is now asking €10.95 million.